Baked brie and apples are a terrific fall version of the classic cheese-and-fruit combination. Slicing the brie rind before baking will make it easier to remove the top and serve with style. As an option to the brie, you can also make a creamy blue-cheese-and-yogurt dip to serve alongside the apple chips. For Apple Chips, in heavy, very large straight-sided skillet heat oil until hot over medium heat. Place apple slices on paper towels; pat dry. Using slotted spoon, carefully add about 12 apple slices to hot oil. Fry 4 to 5 minutes or until apple slices are golden brown with a hint of white, turning frequently**. Using slotted spoon, transfer apple slices to paper towels to drain (chips will crisp as they cool). Repeat with remaining apple slices. Coat 9-inch pie plate with non-stick cooking spray, or use ceramic pizza stone or oven-going serving platter. Place brie in center of dish. Bake 17 minutes. Remove from oven. Using knife, gently remove crosshatched rind sections from brie. Bake 6 minutes more or just until melted. Lightly sprinkle brie with salt; garnish with thyme sprig, if desired. 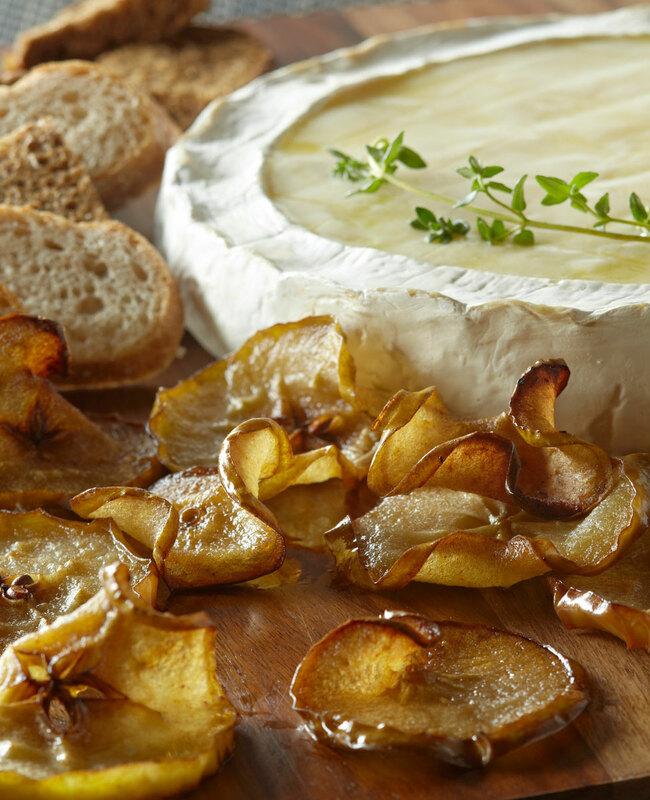 Serve immediately with Apple Chips and baguette slices. Makes 8 servings. *Tip: For easier slicing, use a mandolin to slice apples. **Tip: The oil should sizzle around edges of apple slices. Adjust heat as necessary to maintain the sizzle. Optional Yogurt Dip: In a small bowl combine 1 cup plain Greek yogurt, 1/2 cup crumbled blue cheese, 2 tablespoons milk, and 1/2 teaspoon salt.